If there is a chance to put a mark in a different continent, why not make a move yesterday? I assume that bands have that in mind, but it takes time and patience. 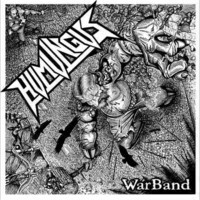 The eight years running US Thrash Metal band, HUMUNGUS, probably decided that the time was right to enter the European lands and therefore, signing to label was a necessity. Nowadays, the band is releasing their debut album, “Warband”, through the German Killer Metal Records. The album was originally issued to the public independently three years ago, however, in order to capture the attention of the Europeans, signing with a German label specializing in old school Metal was key. When I set my eyes on the record, I thought that it was to be one of those humorous Thrash Metal albums with clear crossover inducements such as LICH KING or DR. LIVING DEAD. Well, I was half right. HUMUNGUS sounds pretty serious, nonetheless, there are a few eye blinks and smirks bursting out. Like the acts mentioned, the band is reliving the late 80s yet with deep respects to the golden age of Metal, driven by the grandeur of early SLAYER and HELLOWEEN but with a street type, head on attitude touching steel with 80s ANTHRAX, slightly embracing the crossover with Punk while letting the Metal do the talking. Within “Warband” is it expect the expected right from the starting point. However, it appeared to me that sometimes they overdid it in their songwriting, attempting to enhance the songs with further verses and C parts, coming across additional riffs that may sound foreign to the tunes. Let’s be honest, I didn’t expect any reinvention or uniqueness out of HUMUNGUS, which isn’t a bad trait at all, yet it felt as if there were moments were the band wanted a bit more of themselves, understandable, but didn’t quite manage it. Eventually, it is all about keeping the peace by protecting the strongly burning flame of old school Metal, no more and no less. HUMUNGUS proved that they can safeguard the flame and do it adequately. Such hits as “Martial Law”, which is pure old ANTHRAX mixed with mid 80s SLAYER, nailing it to be their best song of the album, the speedy blazing fist of fury “Shark Castle”, carving the ground with the magnificence of 80s US Metal chops and the war crying trailblazer “Wasteland Warriors”, determined that there is a strong potential in this group, such prospect should be exploited for later releases. Fans of old school Metal would like to tear this album a part, I am positive of that. However, the entry isn’t closed to purists only. “Warband” displays a band with a way to go, yet such a band that proved itself for the challenge, tackling it with conviction. Europe bear notice.